Now let's consider the each plan item separately and in full. The game chief aim is to get cards with total as much closer to 21 points as it possible without going beyond of this mark. If you get more total points than the dealer (your principal rival) - then you win. And vice-versa. You win automatically if you get 21 points (blackjack) at once with your 2-card initial hand. You lose automatically (go bust) if your total goes beyond 21 points. If both of you (the dealer + the player) get blackjack combination or the same final total then the tie is announced (also it may be called push). 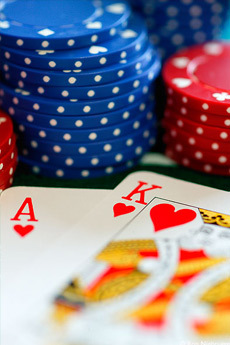 You buy insurance if the dealer face-up card is an Ace and you foresee his blackjack combination is coming. After your acting the dealer steps the stage and start to make his own decisions. The card suits are out of importance according to rules for Blackjack. Surrender - you withdraw the round and get the half of your initial wager compensation.